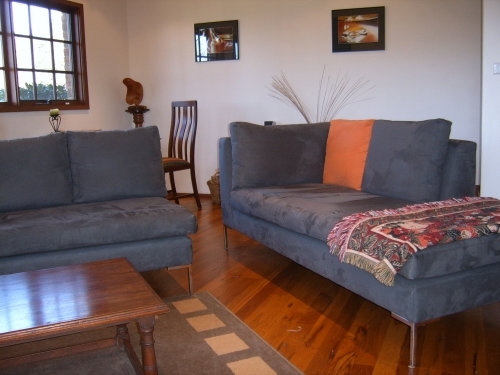 Yallambee B and B is situated in a quiet location on the edge of the Morton National Park, Yallambee is sited on an acre of terraced gardens and lawns. Walk to Glow Worm Glen or the Mark Morton or Riverview lookouts from the doorstep or link to longer trails in the National Park to experience waterfalls or even the Erith Coal mines. Modern and stylish accommodation in three double en suited rooms. Suitable for couples or families looking for a relaxing experience with fabulous food. Just minutes away from the village of Bundanoon, Yallambee is a modern and stylish B&B set in a very quiet location adjacent to the Morton National Park. The house sits centrally on an acre of terraced gardens, and has an outlook over the treetops of the National Park. Many of the parks features - lookouts, stunning walks and the Glow Worm Glen are accessible from the doorstep. 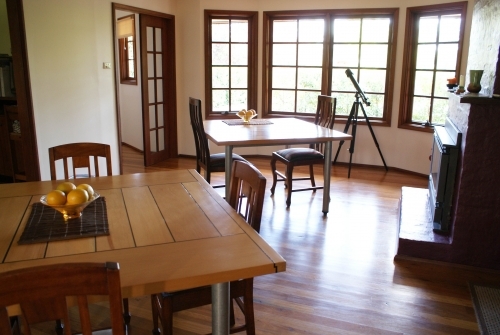 three spacious guest bedrooms, two located on the upper floor of the house. The North Room has a queen bed, single sofa bed, large ensuite (with large luxurious bath and double shower), and the South Room has a king size bed and shower ensuite. A third guest room is located off the dining room with a queen bed, double day bed, shower ensuite and views over the garden. All rooms have quality linen and bathrobes. Downstairs is a well appointed guest lounge.